Police secure the scene where an attacker was shot by police after he attacked and hurt an off-duty officer with an 11-inch meat cleaver. A man attacked an NYPD officer with a meat cleaver near Penn Station in midtown around 5 p.m. on Thursday, at the start of the evening rush. The suspect, who struck the cop in the head with his blade, was shot by police. The assailant was taken to the hospital and is in critical condition. Police first encountered the suspect, 32-year-old Akram Joudeh, trying to take a boot off his car near 31st Street and Broadway. After the cops approached him, Joudeh apparently brandished the meat cleaver. The suspect, who allegedly refused to drop his weapon, fled west down 32nd Street. Cops chased him. One officer tried, and failed, to Tase him, and Joudeh kept racing down the block, at one point climbing up the front of a marked cop car. Police were struggling to subdue the suspect when an off-duty police officer — who was on his way to Penn Station for his evening commute home — witnessed the confrontation and rushed to assist the uniformed cops. Upon arriving at the scene the officers encountered a male who removed a 11-inch meat clever from his waistband & fled west bound. Joudeh then attacked the off-duty cop, slashing the officer in the face or head with his 11-inch cleaver. Police responded and fired on the suspect at least 18 times, reports ABC 7. That wounded officer was taken to the hospital with a six-inch gash. He is listed in serious condition, but is expected to survive. Another cop was grazed by a bullet after police opened fire; his injuries are reportedly non-life-threatening. 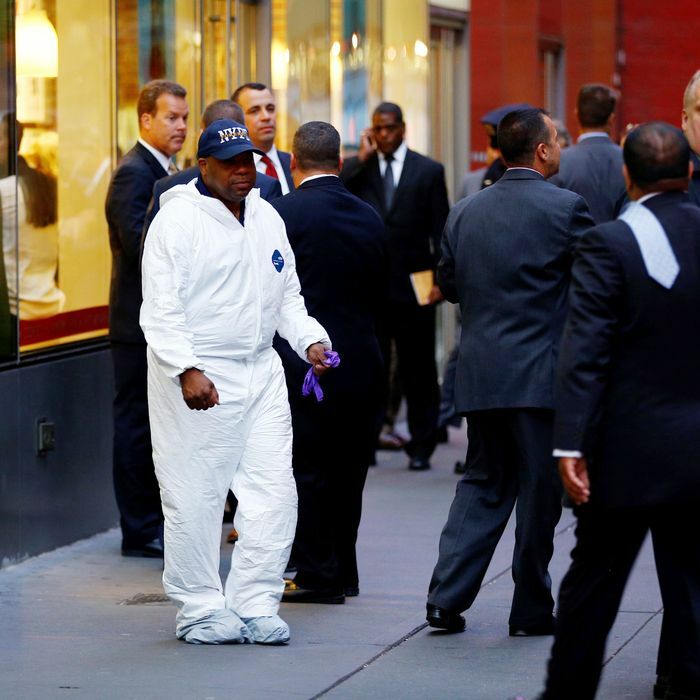 Police flooded the crime scene, and the blocks near Madison Square Garden and Penn Station were reportedly closed off to foot traffic during the investigation. Joudeh, a Queens resident, has at least 15 prior arrests. One of his most recent run-ins with police reportedly occurred on August 27, when he was picked up near a synagogue with a knife. Sources told the New York Post that Joudeh was acting like an “emotionally disturbed person” before the cleaver attack Thursday, and had allegedly been ranting about the boot on his car. In 2014, an ax-wielding man attacked NYPD cops in Jamaica, Queens, injuring one rookie officer critically and hurting another cop. Cops shot and killed the assailant, whom police later classified as a radicalized “lone wolf” terrorist.